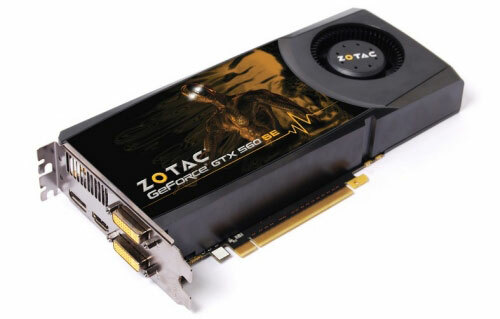 ZOTAC quietly slipped in a new GeForce GTX 500-series graphics card yesterday, the GTX 560 SE. The GeForce GTX 560 SE is a new variant of the GTX 560 and here in the SE, Special Edition, the E also stands for Economy. When looking at the spec of this card compared to the standard GTX 560 we can see where this economy has most probably come from; the ZOTAC GTX 560 SE has just 288 CUDA cores and a core clock of 745MHz compared to the 336 CUDA cores and core clock of over 800MHz for the full-fat 560. Also, this card has a 192-bit memory bus compared to the 256-bit on the proper '560. One questions whether this should be called a GTX 560 after all. ZOTAC has no doubt got a good price for these GPUs and made this GTX 560 SE with a good price point to match. Price-to-performance is a ratio that’s very important in this business. The card is expected to be priced just over the £100 mark. So it slots just under the GTX 560 and is a competitor to the AMD's Radeon HD 7700 in both price and performance, according to benchmarks surfacing on the web, though its 150W TDP is fundamentally higher than the nascent HD 7770's. The Hong Kong-based ZOTAC says this new card will give gamers 1080p gaming on a budget: “1080p resolution displays and Microsoft® DirectX® 11-enabled titles are affordable and become quite popular among gamers. Our new ZOTAC® GeForce® GTX 560 SE provides an excellent value for gamers that want to get their feet wet with 1080p and DirectX® 11 gaming,” said Carsten Berger, marketing director, ZOTAC International. Other indicators of this card's performance come from its strikingly similar specs to the previously released but OEM-only GeForce GTX 555 - a GPU which comes installed in Alienware X51 desktops.